Imagine… You’ve been waking up fully rested, starting the day off with a warm lemon water and enjoying every bite of your breakfast. It is not only satisfying but nutritious. It fuels you with the right kind of energy and you go on your day filling it with positive self-talk, good food and good company. You’ve been feeling fantastic, exercising, eating well until that one gloomy day where everything shifted. You started your morning as usual but when you got to work, there it was, the feeling of temptation. Your coworker celebrated their birthday and brought in leftover chocolate cake. The type of cake filled with ‘the not so good feeling’ ingredients. You’ve been doing so well for the past few weeks, but all you’re thinking about is fighting the temptation of ‘rewarding yourself’ with a slice of cake. How do you resist the temptation of junk food that surrounds you in your daily work environment? This is a question that I get asked often and most recently by a representative of The Ladders, a comprehensive career platform that helps make job searching simpler, focused, and more efficient. I remember when I worked at a corporate office, there would be snacks and treats every week. There were many celebratory events that included some sort of unhealthy snacks - coworkers brought over leftover Halloween candy, cupcakes for a retirement party, homemade sugar cookies, and so on. But let’s get one thing straight. We all get cravings and it’s okay to cave in. We just need to remember not to make it a habit. Remember, one bad snack will not undo all the good you’ve done in the recent days, weeks or months, just like doing a one day detox will not undo all the unhealthy habits you’ve adopted over the years. The key is to be aware of the situation, aware of your feelings and willing to let go once the moment has past. If you decide to go ahead and take a slice of cake, take the smallest piece, enjoy every bite and tell yourself “This is what I needed at this moment.” and let it go. If you decide you don’t want to cave in, here are a few ways to avert the temptation. Every time you find yourself in a tempting situation, pull out your statement and read it twice, three times or five times. You will strength the statement/affirmation and you will lessen the urge. So, next time you are faced with temptation to eat junk food, ask yourself: “Is this going to serve me and make me a healthier individual?” And if you do fall into temptation, don’t be so hard on yourself. We need a sense of balance in our lives and it’s okay to slip up. We are only human. 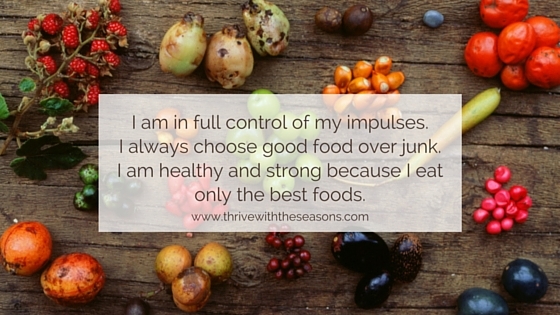 How do you overcome temptations or cravings to junk food? I would love to know! Leave your tips and tricks in the comments below. *Disclaimer: I was contacted by the team at The Ladders and asked to write a blog post about fighting the temptation to eat junk food at work. I thought it was a great topic so I agreed. I was not compensated for my time nor given any free products/services. All opinions are, as always, 100% my own. If you’re currently searching for a job, feel free to check out their Career Search page to see what you can find.